Planning a road trip? Want to make an extra stop somewhere along your way? Maps can now take you from A to B…and then to C, D, and E! We heard your requests to allow multiple stops when getting directions, so we built it. When you’re getting directions, hit the “+” button to add stops, or right-click on the map and select “Add destination” to add it to your trip. Then you can see your full road trip on one map, click in to see individual segments, or print out all your directions at once. 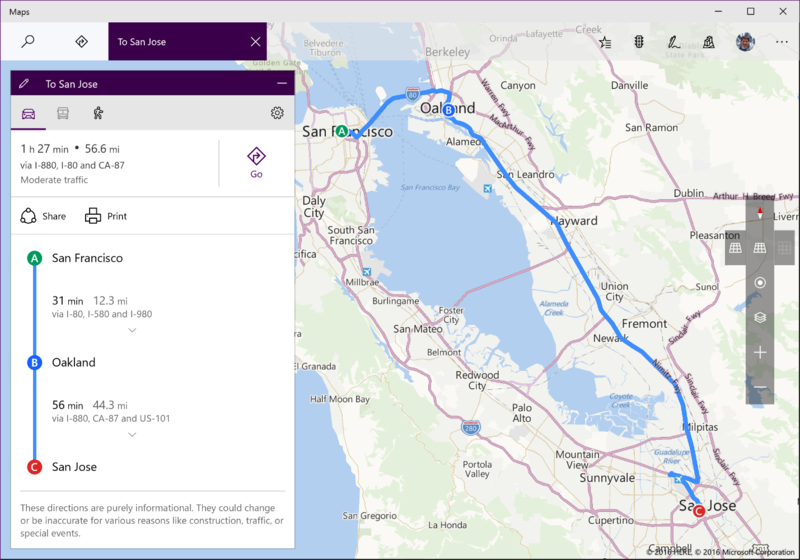 Or select “Go” on your Windows 10 phone to get voice guidance to each of your stops in order.